Schizophrenia cannot be diagnosed by a laboratory test. Apart from the clinical description, some diagnostic systems give emphasis to the duration of symptoms. One month to six months of symptomatic state is needed to assign a diagnosis of schizophrenia by ICD-10  or DSM-IV. In acute, first-time presentations, patients may need to undergo some investigations to rule out a possible neuropathological basis of the illness. Some common neurological conditions may present as schizophrenia-like psychosis, albeit rare. Investigations have unearthed some brain changes (enlarged ventricles and loss of grey matter) in schizophrenia patients early in the course of the illness. This loss also progresses in some patients with neurodegenerative process. Environmental effects trigger a cascade of pathophysiology such as proinflammatory cytokines, reduced neuroplasticity and premature aging. Some scientists have also implicated the treating drugs as partly contributory to these processes. Treatment of schizophrenia is challenging. Antipsychotic drugs of the first generation produced extrapyramidal side effects. The second generation drugs are related to worsening or causing obesity and dyslipidemia. A sizeable proportion of patients do not obtain remission or even satisfactory symptom-relief. Positive symptoms may show good response to drugs, whereas negative and also cognitive symptoms either fail to respond or even worsen with most of the antipsychotic therapies. As a result patients may need cognitive remediation (a treatment still to emerge successfully). They may have attendant depressive symptoms as part of the disease or as a side effect of drugs, thus compounding the illness and disability thereof. A good proportion of patients develop secondary complications, clinical as well as psychosocial. Tardive extrapyramidal syndromes, metabolic syndromes, defect state, suicide attempts are a few of these. Patients are often non adherent to treatment. The caregivers face burden and develop significant burn out. Patients who do not remit generally end up in after-care homes. Divorce/separation is a common social complication. Drugs used in the treatment of schizophrenia do not yield satisfactory results. Negative and cognitive symptoms almost always remain nonresponsive. Obesity and metabolic syndrome coexist with schizophrenia with or occasionally even without concurrent drug therapy. Patients develop endocrinological and menstrual dysfunction as a result of drugs. Yoga has demonstrated success in improving cognition, has improved obesity as well as metabolic syndrome, helped in correcting menstrual disturbances and some other endocrine dysfunctions. It is in this context, a role for yoga has been conceived in the treatment of schizophrenia after medications produce their effects. However, there were very few studies looking at the feasibility and efficacy of yoga therapy as an intervention in this, the most serious disorder treated by psychiatrists. There may be several reasons for this. Firstly, the concept of yoga as a therapy rather than lifestyle is not acceptable to many yoga purists/schools. Secondly, the feeling that patients with schizophrenia may not be able to perform all aspects of yoga, particularly the mental aspect, as recommended. Thirdly, the lack of insight and poor adherence to treatment in most patients may discourage researchers from recommending yoga to these patients. Fortunately, the last few decades have seen significant efforts in this direction, with several controlled studies with rigorous methodology being conducted in this population. However, many of these are not yet reflected in peer-reviewed literature. A recent meta analysis of the effectiveness of yoga as a complementary treatment for all psychiatric disorders  included only one randomized controlled trial in schizophrenia. Another systematic review of the benefits of physical therapy for people with schizophrenia  reported that yoga reduces psychiatric symptoms, state anxiety, and psychological distress and improve health-related quality of life, but that the heterogeneity of the interventions and the small sample sizes of the included studies limit overall conclusions. In this light, there is a need for a comprehensive review of yoga as an intervention in patients with psychosis (particularly schizophrenia). This is the focus of the current review. With this focus, relevant literature was obtained using the following methods: An English language literature search of PubMed/MEDLINE, Google Scholar, and EBSCO using the search terms 'Yoga AND Schizophrenia' and 'Psychosis AND yoga' as well as a direct search of reference list of pertinent journal articles. Information on manuscripts accepted and under review for publication in journals, as well as dissertations and project reports, was also solicited from centres where such research is ongoing, particularly in India. In both groups negative syndrome score dropped over the four months. However, the yoga group performed better. Likewise, social dysfunction score too reduced over the four months and the yoga group obtained an advantage [Figure 1]. Positive symptoms had little scope in this sample for further improvement; yoga, naturally, did not confer any benefits on this account. A recent randomized, controlled pilot study by Visceglia et al. included 18 clinically stable inpatients (12 males and 6 females) with schizophrenia residing at a state psychiatric facility. Out of them 10 patients were randomized to an eight-week supervised yoga program (2 sessions/week) and the rest were waitlisted.The yoga module included postures, breathing exercises, and relaxation. Psychopathology and quality of life was measured using the PANSS and WHOQOL-BREF respectively, at baseline and after 8 weeks. Subjects who received yoga therapy achieved significant improvements in psychopathology scores (PANSS total and subscale scores) and quality of life (physical and psychological domains). In view of the small sample size, the authors have concluded that the results need confirmation from larger studies. The above studiesmay be seen as preliminary, and confirmation with different objectives would be ideal: Some of the active research questions may be the following: (1) the observed benefits of either yoga or exercise must be compared with a waitlisted group, (2) cognitive measures in schizophrenia must also be obtained rather than mere clinical syndrome measurements, (3) benefits of yoga in acute inpatients with psychosis should be studied and (4) biological mechanisms of yoga in schizophrenia need to be investigated. A recent study  extended the investigation of yoga efficacy in schizophrenia. Outpatients stabilized on antipsychotic medications without recent (three months) changes in medicines were contacted. Patients with a Clinical Global Impression - Severity rating of >3 were excluded. Among the rest, patients who were consenting to be randomized to this three-arm trial of yoga were included. The design was prospective and randomized. In addition to yoga and exercise groups, there was a third waitlisted group for the 4 months of study. The sample size was estimated a priori. Giving margin for dropouts, a sample size of 120 patients (40 in each group) was considered adequate. To recruit 120 patients nearly ten times this number had to be interviewed. The reasons for this have been the subject of a different paper. The therapist ensured that they attended at least 12 classes (or more) in the first month. Subjective judgment of learning yogasana well enough to be practiced at home was satisfactory in all patients. Family members were encouraged to motivate patients to adhere to the yoga/exercise sessions as regularly as possible in the next three months. The patients were assessed on clinical symptoms, social function and a tool for social cognition. The rater was uninvolved in treatment allocation. The study was able to confirm the earlier findings. 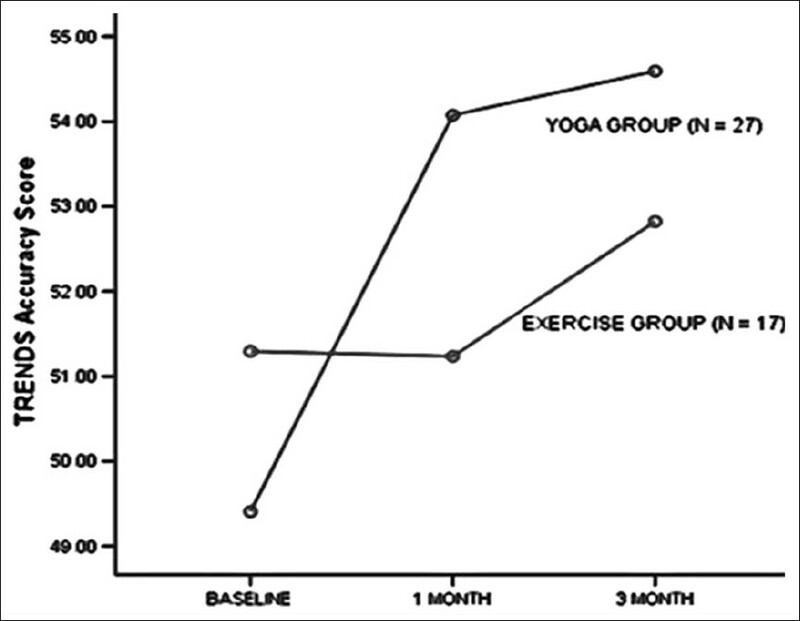 Yogasana helped in reductions of scores on negative syndrome significantly [Figure 2]. The yoga and exercise groups in the above two studies , were identical. Likewise, the two studies used similar assessment schedules. The pooled data from both studies was reanalyzed. The data confirmed the observed benefits of yoga in negative symptoms. The effect size was larger (article under review for publication). A large effect size is supportive of clinical effects of yoga therapy in negative syndrome. Another connected study by the same group has been able to confirm the feasibility and effectiveness of yoga in improving symptoms of schizophrenia in a naturalistic crossover design. The waitlisted patients in the above quoted study  requested yoga after the study period. The patients had been assessed at the time of inclusion into the previous study as waitlist controls and the assessments had been repeated after one and three months. After the study period when they sought yoga therapy, their clinical states were assessed before and after one month's yoga therapy. The benefits of yoga were demonstrable at the end of 1-month intervention. In the study by Gangadhar et al,  a social cognition test was performed at baseline and at the end of the study. This test measured the patient's ability to recognize facial emotions. The tool used is standardized with Indian patients - Tool for Recognition of Emotions in Neuropsychiatric Disorders (TRENDS). The score on the number of images emotions correctly recognized by the patients was obtained - TRENDS Accuracy Score (TRACS). One of the limitations of this study may be that by virtue of lower TRACS at baseline, the yoga group had a scope for improvement and hence significant results were obtained. Also, not all the randomized patients cooperated for this testing, which weakened the randomization effect. Perhaps a separate study to replicate/confirm these findings is necessary. There is also a need to extend this work to demonstrate if improvement in social cognition is accompanied by a demonstrable physiological change in the brain. In the above studies of yoga in schizophrenia, the patients were selected from outpatient services and were on follow up for long periods. Most were ill for several years. Over decades of observations, psychiatrists have noted findings suggestive of irreversibility with time. In fact, treating the disease early (therefore reducing the duration of untreated psychosis), is well reported to predict a better outcome. Therefore, introducing yoga at a later stage of the disease may produce only limited effects. Also, the differential effect of adding yoga in the early stages of treatment is an important clinical question. A pilot study of a short-term yoga module evaluated in-patients being treated for psychosis, including schizophrenia. Consecutive patients who were reaching a clinical state that was adequate to engage them in yogasana practices were approached. Consent from both the patient and the relative was obtained after adequate information. These patients continued to receive the antipsychotics prescribed by their treating team. Consenting patients who met these conditions in the wards were recruited into the study. The patients were randomized to receive additional yoga therapy sessions for the next two weeks or until discharge, the other group received physical exercise. Yoga was taught for first two weeks only and patients had to practice in the month of care at home.They were assessed by the same clinician before and after the 2-week trial as well as a month later. Cross-over design is a well-conceived standard practice in psychopharmacological research. Each individual has a propensity to get better and these 'individual-related' factors are taken care for in randomized trials. However, they cannot directly control for the time-effect. The course of the illness as well as expectation bias may have a confounding effect on the scores. Randomized cross over is an alternative in which two or more drugs can be compared in a within a diagnostic group. One of the treatments is given first for a pre-decided duration at the end of which the patient is crossed over to the other alternative. Therefore, the active and comparative treatments are applied to the same subject without/with subjects' knowledge. The blinding in the former case attends to the expectation effect. However, yoga is unique; the patient cannot be 'blinded'. The confounding factor of the natural course of the illness can be partly answered by the randomized cross over effect, viz., one group receives the test followed by control treatment, whereas the other randomized group will receive the control treatment followed by test treatment. While this is an ideal situation, it is not known if yoga effects end with stopping of practice. If not, what is the time interval before the benefits, if any, are lost? Notwithstanding these limitations, a'naturalistic' cross over study has been attempted. In the recently completed 3-arm trial in schizophrenia  outpatients, the waitlisted patients were offered 1- month training of yoga at the end of the study if they wanted. Consent was sought if they can be systematically assessed on rating scales before and after one month of yoga therapy. Consenting patients (n = 14) were assessed like they were assessed when they were in the waitlisted group is the 3-arm trial. Well-being and quality of life have become better after yoga. Depression lifts, and social sensitivity, the ability to recognize emotions in others, improves. How does yoga effect this change? A recent study randomized schizophrenia patients to receive yoga or remained waitlisted for one month.The yoga package used in this study was the same as used and published in the paper by Duraiswamy et al. 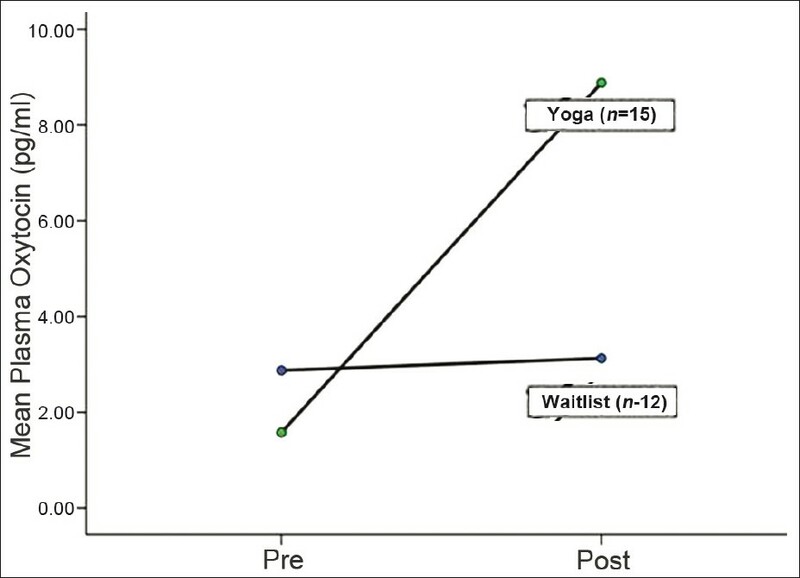 Consenting patients who participated demonstrated significant benefits in emotional recognition (TRENDS scores) following yoga However, no such benefit was demonstrated in waitlisted subjects. Blood samples were collected before and after yoga or waitlist period. The samples were analyzed for oxytocin levels. Oxytocin levels rose significantly in yoga group, nearly threefold. No such change was evident in waitlisted group [Figure 4]. This supports the possibility that oxytocin elevations are caused by yoga. This mechanism may explain the benefits in social cognition as well as the wellbeing effect following yoga. Figure 4: Plasma oxytocin levels increased significantly in patients doing yoga, as compared to no significant change in the waitlist group (Jayaram 2012). This was an offshoot of observation in a hospital setting. Clearly, over 50% of patients suitable for yoga could not avail the same. Although unwillingness to participate in research/trial was not quoted as the most striking or important reason in any, it may be suspected that the 20% who did not give any reason but refused to participate in the study may have done so not wishing to go through research. Among the others who refused, the reasons were logistic, e.g., living far away, no one to accompany, employed/working patients. Very few did not want yoga. How can these logistic barriers be reduced? Can yoga be reached closer to their residence? Can yoga be taught in a shorter period than one full month? For example, many patients with schizophrenia come for follow up once a month for medications or other interventions. Is it possible to develop a less conventional once a month training for schizophrenia patients? Lastly, mental hospitals and after-care homes may regularly provide supervised yoga therapy by a visiting instructor who may be employed for part or full time. Yoga-based, stand-alone or add-on treatments should be provided to the psychiatrically ill in the hospitals. Reaching this service to community-based patients is yet another challenge. National mental health programs must include this feature for the service of the mentally ill.
Yoga as a therapy in psychosis, specifically schizophrenia, has been demonstrated to be feasible and effective as an add-on therapy. Most of the studies have used a combination of asanas and pranayama, avoiding meditation. The effects are multifaceted, including reduction of psychotic symptoms and depression, improving cognition, increasing quality of life, and producing neurobiological changes, such as increased oxytocin levels. Further research is needed into the exact mechanisms of action of yoga in producing the above changes, as well as overcoming the barriers in reaching yoga to the majority of patients suffering from this devastating illness. We acknowledge contributions from Dr. Jagadisha Thirthalli, Dr. Ganesan Duraiswamy, Dr. Aarti Jagannathan, Dr. Rishikesh Behere, Dr. Santosh Kumar, Dr. Shubhangi Baspure, Dr. Naveen Jayaram, Dr. H R Nagendra, and the team at the Advanced Centre for Yoga at NIMHANS, in the research quoted in this paper. We also acknowledge funding support from the Dept. of AYUSH, Government of India to Dr. B N Gangadhar for the research project "Efficacy of Yoga as an Add-on Treatment in Schizophrenia". The authors also thank Dr. I V Basavaraddi, Director of the Morarji Desai National Institute of Yoga, for collaboration with the Advanced Centre for Yoga that provided infrastructure and support to some of these activities. 1. Murray CJL. The Global Burden of Disease; A comprehensive assessment of mortality and disability from diseases, injuries, and risk factors in 1990 and projected to 2020. Cambridge MA 1996. 2. Edwards J, McGorry PD, Waddell FM, Harrigan SM. Enduring negative symptoms in first-episode psychosis: Comparison of six methods using follow-up data. Schizophr Res1999;40:147-58. 3. Buckley PF, Stahl SM. Pharmacological treatment of negative symptoms of schizophrenia: Therapeutic opportunity or cul-de-sac? Acta Psychiatr Scand 2007;115:93-100. 4. Kee KS, Green MF, Mintz J, Brekke JS. Is emotion processing a predictor of functional outcome in schizophrenia? Schizophr Bull 2003;29:487-97. 5. Hofer A, Benecke C, Edlinger M, Huber R, Kemmler G, Rettenbacher MA, et al. Facial emotion recognition and its relationship to symptomatic, subjective, and functional outcomes in outpatients with chronic schizophrenia. Eur Psychiatry 2009;24:27-32. 6. WHO. Clinical description and diagnostic guidelines. The ICD-10 classification of mental and behaviour disorder. Geneva: Washington DC: World Health Organization; 1992. 7. American PA. Diagnostic and statistical manual of mental disorders. 4 th ed. Washington (DC): American Psychiatric Press; 1994. 8. Ward KE, Friedman L, Wise A, Schulz SC. Meta-analysis of brain and cranial size in schizophrenia. Schizophr Res 1996;22:197-213. 9. Cabral P, Meyer HB, Ames D. Effectiveness of yoga therapy as a complementary treatment for major psychiatric disorders: A meta-analysis. Prim Care Companion CNS Disord 2012;13: Pii: PCC.10r01068. 10. Vancampfort D, Probst M, Helvik Skjaerven L, Catalán-Matamoros D, Lundvik-Gyllensten A, Gómez-Conesa A, et al. Systematic review of the benefits of physical therapy within a multidisciplinary care approach for people with schizophrenia. Physical Therapy 2012;92:1-13. 11. Walsh R, Roche L. Precipitation of acute psychotic episodes by intensive meditation in individuals with a history of schizophrenia. Am J Psychiatry 1979;136:1085-6. 12. Nagendra HR, Telles S, Naveen KV. An integrated approach of Yoga therapy for the management of schizophrenia. Final Report submitted to Dept. of ISM and H, Ministry of Health and Family Welfare, Government of India New Delhi 2000. 13. Duraiswamy G, Thirthalli J, Nagendra HR, Gangadhar BN. Yoga therapy as an add-on treatment in the management of patients with schizophrenia-a randomized controlled trial. ActaPsychiatrScand2007;116:226-32. 14. Visceglia E, Lewis S. Yoga therapy as an adjunctive treatment for schizophrenia: A randomized, controlled pilot study. J Altern Complement Med 2011;17:601-7. 15. Gangadhar BN, Varambally S, Thirthalli J, Jagannathan A., Kumar S., Venkatasubramanian G., et al. Therapeutic efficacy of add-on yogasana intervention in stabilized outpatient schizophrenia: Randomized controlled comparison with exercise and waitlist. Indian J Psychiatry 2012 (in press). 16. Baspure S, Jagannathan A, Kumar S, Varambally S., Thirthalli J., Venkatasubramanian G., et al. Barriers to yoga therapy as an add-on treatment for schizophrenia in India. IntJ Yoga 2012;5:70-3. 17. Meghana D, Thirthalli J, Gangadhar BN. Feasibility and effectiveness of yoga as an add-on treatment in waitlisted schizophrenia patients. 18 th International Conference on Frontiers in Yoga Research and Applications. PrashantiKutiram, SVYASA, Bangalore, India; 2009. 18. Behere RV, Arasappa R, Jagannathan A, Varambally S, Venkatasubramanian G, Thirthalli J, et al. Effect of yoga therapy on facial emotion recognition deficits, symptoms and functioning in patients with schizophrenia. Acta Psychiatr Scand 2010;123:147-53. 19. Manjunath RB. Efficacy of yoga therapy as an add-on treatment for in-patients and out-patients with functional psychotic disorder [Dissertation]. Bangalore: Psychiatry, National Institute of Mental Health and Neurosciences; 2009. 20. Feifel D. Is oxytocin a promising treatment for schizophrenia? Expert Rev Neurother 2011;11:157-9. 21. Jayaram N. Effect of yoga therapy on plasma oxytocin and facial emotion recognition deficits in patients of schizophrenia. Bangalore: Psychiatry, National Institute of Mental Health and Neurosciences; 2012.